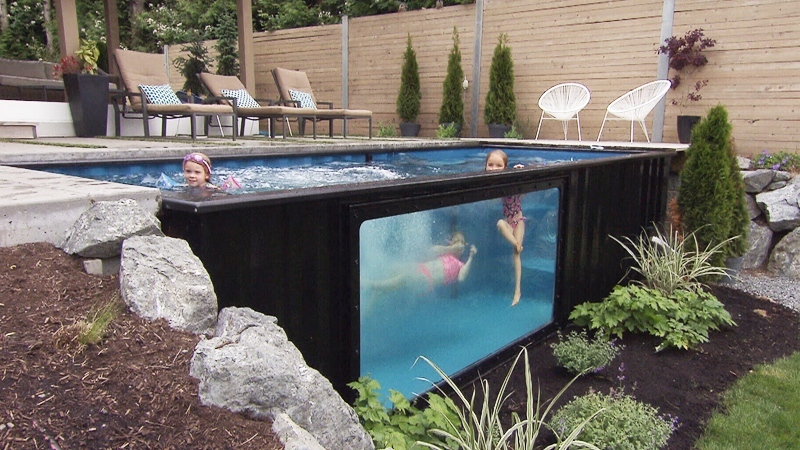 An Abbotsford company is taking a unique spin on recycling, by converting metal shipping containers into pools and hot tubs that can be installed at your home, within minutes of delivery. ModPools was founded by Paul and Denise Rathnam, who came up with the idea after being inspired by combination hot tub-pools while vacationing in Palm Springs. "Originally when we had the idea we thought, well, it's probably too small. But when we started experiencing their pools we found that size wasn't necessarily the issue,” said Paul. The 20- and 40-foot (six- and 12-metre) shipping containers are cut down and refitted in the couple’s Abbotsford shop. The standard size pool is eight feet wide and 20 feet long and just over five feet deep, or 2.4 metres by six metres, with a depth of about 1.5 metres. And each pool can be turned into a giant hot tub. You can use an app to control temperature, jets and lights. "We wade out, glass of wine under the stars and it's a huge hot tub," explained Denise. An added window helps you forget it’s a shipping container and is a safety feature too. “I can be in my yard and I can watch my kids swim. If there’s an issue, I’m right there,” said Paul. Since March, the company has received 30 orders, which are mostly from the U.S. The standard 20-foot pool costs $35,000. The Rathnams say it beats the cost of a regular pool, which can be more than double, and it’s also a way to help repurpose shipping containers that are left behind when a ship returns overseas. And even in the winter months, the pools can be used with the hot tub feature. Paul said his own pool had about 5 centimetres of ice on it this past winter and he was still able to bring the temperature up to 104 degrees fahrenheit (40 C) in about two and half hours.